A newfoundblack hole has been caught in the act of releasing a prodigious amount ofenergy from the most powerful pair of jets ever seen from such a cosmic object.But the real surprise is what is created by those jets. Astronomersnoticed that the strong jets from this specific type of black hole, called a microquasar,are slamming into the surrounding interstellar gas, heating it and creating a massivebubble of hot gas that is 1,000 light-years across. Microquasarsare black holes that are also known as X-ray binaries, with jets of high-speedparticles being a chief characteristic. Some microquasars have been known toproduce gas bubbles due to the interaction of the jets with the surroundinginterstellar medium, but these bubbles are typically relatively small ? lessthan 10 light-years across. Thisnewly observed gas bubble is twice as large and tens of times morepowerful than other known microquasars. "Wehave been astonished by how much energy is injected into the gas by the blackhole," said the study's lead author Manfred Pakull of the University of Strasbourg in France. "This black hole is just a few solar masses,but is a real miniature version of the most powerful quasars and radiogalaxies, which contain black holes with masses of a few million times that ofthe sun." Thesurprising discovery was made using the European Southern Observatory's VeryLarge Telescope and NASA's Chandra X-ray telescope. The findings are published inthis week's issue of the journal Nature. Thegas-blowing black hole is located 12 million light-years away, in the outskirtsof the spiral galaxy NGC 7793. Judging by the size and expansion velocity ofthe gas bubble, the researchers have calculated that the jet activity must havebeen ongoing for at least 200,000 years. Blackholes are known to release enormousamounts of energy when they gobble up matter. It was commonly believed thatmost of the energy was released in the form of radiation ? predominantlyX-rays. Thisnew discovery, however, shows that some black holes can release at least asmuch energy (and perhaps much more) in the form of collimated jets of fast-moving particles. These jets heat the surrounding interstellar gas,triggering an expansion. The inflating bubble that results contains a mixtureof hot gas and ultra-fast particles at different temperatures. 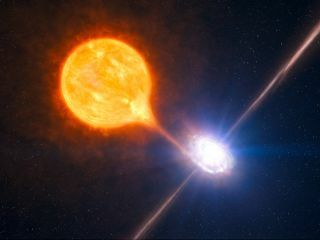 "Inmicroquasars the black hole has a companion star, it forms a binary star,"Pakull told SPACE.com. "If the companion star is sufficiently big, itloses material which can fall onto the black hole. During that process (whichwe call accretion), the potential energy of the material is converted into heatand radiation that we observe as X-rays." Someof that potential energy can also be converted into kinetic energy, he added.That's where the black hole jets come in. "Inour object, most of the energy is indeed converted into jets, and very littleinto X-ray radiation," Pakull said. Pakulland his team of astronomers used observations in optical, radio and X-ray bandsto calculate the total rate at which the black hole is heating itssurroundings. Theresearchers examined the spots where the jets smash into the interstellar gaslocated around the black hole, and were able to determine that the bubble ofhot gas is inflating at a staggering speed of almost one million kilometers perhour. "Thelength of the jets in NGC 7793 is amazing, compared to the size of the blackhole from which they are launched," said co-author Robert Soria of the Mullard Space Science Laboratory at theUniversity College London. "If theblack hole were shrunk to the size of a soccer ball, each jet would extend fromthe Earth to beyond the orbit of Pluto." Atthe moment, the astronomers are not able to measure the size of the black holeitself. Thesmallest stellar black hole discovered so far has a radius of about 9.3 miles(15 km). An average stellar black hole of about 10 solar masses has a radius ofabout 18.6 miles (30 km). In comparison, a "big" stellar black holemay have a radius of up to 186 miles (300 km). Yet,these large black holes are still smaller than the jets, which extend out to severalhundred light-years on each side of the black hole. Thefindings of this study will help astronomers understand the similarity betweensmall black holes formed from exploded stars and the supermassive black holes that are located at the centers of galaxies. Powerfuljets have been observed from supermassive black holes, but they were thought tobe less frequent in the smaller microquasar variety. The study suggests thatperhaps many of them have simply gone unnoticed so far.